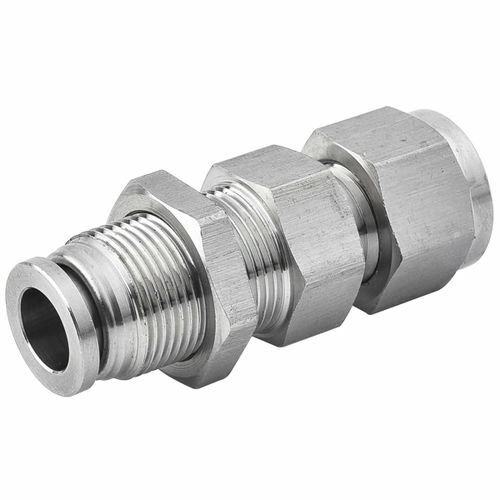 Stainless steel transition fitting bulkhead union are designed to connect soft tube on one end and metal tube on other end through a panel or other barrier; one side is stainless steel push in fitting configuration, another side is stainless steel compression tube fitting configuration. The lock nut holds the fitting securely to the bulkhead. Stainless steel transition fittings are used for air, pneumatic, food & beverage, chemical, medical & pharmaceutical systems. They have an 316 stainless steel body, 316 stainless steel collet and FKM (Viton) seal one the push in fitting end, and 316 stainless steel nut, back ferrule, front ferrule on other end. Designed for use with soft tubing, include polyurethane, polyethylene, nylon, Teflon tubing and hard pipe include stainless steel, carbon steel, copper, titanium, aluminum pipe. Accommodate metric tubing O.D ranging from 4 mm to 12 mm and inch (imperial) tubing O.D from 1/8" to 1/2".